This Is the Life! 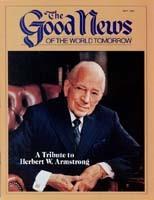 Real Abundant Living By Herbert W. Armstrong of the hundreds of articles Herbert W. Armstrong wrote, the one reprinted here stands out. It brilliantly sums up the wonderful way of life the Bible teaches — the way of life Mr. Armstrong lived and preached to millions. Do you know how to live fully — abundantly? In this article you will learn how you may taste the joys of real abundant living. Why do religious people often seem to feel that their religious life must be one of giving up all the fun and the enjoyment of living — that in order to please God, they must endure a life of morbid gloom? Sin to many of these people consists of things that many other people consider to be most desirable. To them, sin is going contrary to a number of" don'ts." "Don't smoke." "Don't dance." "Don't play cards." "Don't go to the theater." "Don't ever touch a drop of alcoholic beverage." " Don't do this!" "Don't do that!" A prominent lawyer's wife once said to me:" I couldn't ever become a Christian. Why, if I had to give up smoking, dancing, card playing, the theater and all the pleasures of life, what would there be left to live for anyway?" A world-famous philosopher, editor and lecturer whom I knew — and who also had no use for religion — said that he did not desire to be repressed or to live a life of painful penance. "I de sire," he said, "to be radiant, cheerful, friendly and to meet people with a smile." Apparently he assumed that such a happy life could not be a religious life. But strangely, none of these people KNEW HOW TO LIVE. Very few have ever found or tasted the true abundant life. Now the Creator, who gives you the breath that you breathe, does not desire for you to live an empty, depressed or an unhappy life. You never please the Eternal by giving up happiness or any thing that is good for you. God Almighty has never given you a single "don't," except those things that are going to harm you, tear you down, bring on un happiness later. Oh, of course, some of these things give you a thrill or a little kick out of life temporarily, but there is always a boomerang. They exact a great penalty later, and the price is too high. It isn't good business. God forbids those things that are bad for us, the things that are going to bring on unhappiness and bring on a life of emptiness and gloom. But never does God Almighty forbid one single thing that is for your happiness, your welfare, your real well-being. I'm reminded of an elderly man who was of the "shouting kind" of religion. He rose up one time in a church meeting and he shouted out a question to those assembled. He said, "Brethren, are you enjoying it, or are you only enduring it?" Some people endure a solemn, stiff and formal church service. And some, emotionally inclined, will go to the kind of church meeting where there is much shouting and much emotional response, merely to have a good time during the meeting. The rest of the week religion doesn't seem to have a great part in their lives. Others feel that if they be come, as they call it, "saved," they must forever after live a gloomy life of giving up every thing that they formerly enjoyed, and that their solemn, unhappy lives of self-denial will somehow please their Creator. Of course, that kind of religion is more or less a superstition! Let's get this matter straight. The founder of the Christian religion, Jesus Christ, said that He came to this earth for a purpose. "I have come," said Jesus, "that they may have LIFE, and that they may have it more abundantly" (John 10:10). Jesus Christ came to bring us the "ABUNDANT LIFE." Do you know what that is? God Almighty intended the real Christian life to be one of joy. Do you know that if you have the real Christian life, if you have the Spirit of God within you, it's going to bring about this result? It's going to, as we say, "produce fruits. " Now what kind of fruits will be produced in a real Christian life? Not the morbid, unhappy life. Here is the fruit. Here is what will emanate from a real Christian life. It is found in Galatians 5, beginning with verse 22. "The fruit of the Spirit" — this is the Spirit of God. This is the Holy Spirit that God imparts only to those who are truly converted. "The fruit of the Spirit is LOVE" — first of all is love — and the second is "JOY." Joy is happiness, brimful and running over. That doesn't sound like an un happy, empty, morbid life, does it? Here's love that will just flow, spontaneously; out from you! The first "fruit of the Spirit" of God is LOVE. Love will mean that your face is beaming. It's going to mean that you are really giving out. It's going to mean that you are radiant and happy. Love results in JOY, the second product of the Spirit of God. The third is "PEACE." Instead of going around quarreling, resentful, bitter, unhappy and arguing — that's not peace, that's a kind of war — you'll be at peace in your mind and with your neighbor, and with your God! And the next is "longsuffering," which in more modern English is "PATIENCE." Impatience makes more people unhappy than almost anything else! If you can really learn the lesson of patience, you're learning one of the things that will make you happy, and make life worth living. The next is "kindness," and then "goodness, faithfulness, gentleness, self-control. Against such there is no law." That is the fruit of the Spirit. It will spontaneously spring forth from you. That, you will be emitting from yourself, radiating from yourself, all the time, if you are a real Christian. You read in Romans 8:9 that unless you have received, from without, the Holy Spirit of God, you are not any of Christ's! You are not a Christian. There are millions of people who profess Christianity who are not Christians according to God's definition. They're not Christians at all! Of course, in a Christian life, there are troubles. There are going to be even persecutions. Jesus Christ was persecuted. He said, "If they persecuted Me, they will also persecute you" (John 15:20). That comes from without. That's something that comes from other people. That doesn't necessarily need to disturb you inwardly. And the person who does have this inward peace, the person who has this joy and this love and this patience — and who has this tolerance for other people — isn't going to be too much disturbed because other people don't agree and perhaps persecute. Yes, you're going to face problems and trials. Those things are good for us. They come upon us for a purpose — to help us develop character. And a real Christian understands. It doesn't make him unhappy. "Beloved [this is speaking to teal Christians], do not think it strange concerning the fiery trial which is to try you, as though some strange thing happened to you." Some people, when some of these trials and these problems come, think nobody else has ever had anything come upon them like that. It's some strange thing that is peculiar to them. That is not true!. Every other person on earth is having problems. Everyone is having troubles. They have things to meet and to overcome, solutions to work out, the same as you do. It's not strange. And so here is the teaching of God. He says: "But REJOICE," yes, rejoice inwardly in these things, "to the extent that you partake of Christ's sufferings." Christ suffered, but Christ also said to ·His apostles, "My joy I leave with you." "I have come," He said, "that you may have life, and that you may have it more abundantly." He came to give us THE ABUNDANT LIFE. He had that kind of life. He was happy. He was filled with joy, even though at the same time He was a man of sorrows — and why? Because He LOVED all human beings, and He saw the way they were going. He saw how they were destroying themselves, how they were bringing unhappiness and emptiness, fear and worry, poverty, sickness, disease and sufferings on themselves. He thereby shared their sufferings. He was a man of sorrows. He was sorrowful for them. But He was a man who was happy inside. He was setting us an example of the kind of life that we should live. So we read here: "Rejoice to the extent that you partake of Christ's sufferings, that when His glory is revealed, you may also be glad with exceeding joy." "Blessed be the God and Father of our Lord Jesus Christ, who according to His abundant mercy has begotten us again to a living hope through the resurrection of Jesus Christ from the dead, to an inheritance incorruptible and undefiled" (I Peter 1:3-4). There isn't one person in 10,000 professing Christians who really knows and understands what that incorruptible inheritance really is. It is far greater — filled with far more splendor and glory, and far more happiness — than you probably ever imagined. That is what is in store for you if you will surrender your life to God. Peter continues, saying that we are kept by the power of God through faith unto salvation, "ready to be revealed in the last time" (verse 5). That means a time yet future, ahead of us just now, only a few years future in our time, at the Second Coming of Christ. Jesus Christ is coming back to this earth once again! "In this," continues this scripture (verse 6), "you greatly rejoice, though now for a little while, if need be, you have been grieved by various trials" or trials and troubles that come upon us, "that the genuineness of your faith, being much more precious than gold that perishes" — be cause this trial of our faith is developing character that will never perish. It's more valuable than gold. What do you do when troubles come? When a trouble comes upon you, instead of griping, grumbling, moaning and being un happy and miserable about it, realize that something is come upon you to try you, to develop character, to develop something in you that you will carry with you for all eternity. But when troubles come, do you rejoice in them? Do you realize that something is come that is more valuable to you than a great sum of gold? Or do you grumble and com plain and wish that such things had never come? Jesus Christ came so that our lives should be changed from what they are. They are to be changed from drifting, going the easy way, acting according to impulse — which builds no character, which is putting nothing into us t hat we can take with us, nothing that is real, that is lasting and permanent — to the life that finds the true values. He gives us a life that does meet and overcome obstacles and temptations, a life that is just filled with happiness, brimful and running over with joy, the real abundant life. We realize what is being accomplished, where we're going. You have a goal if you are Christ's. You have an objective. You know where you're going; you see the progress you're making. It gives you a thrill of happiness. And, incidentally, if your life is the right kind that God desires, which is for your good, if you seek first the Kingdom of God, which is your objective in life — or should be — and His righteousness, the right ways of life, He says that all these material things shall be added. God, perhaps, may not add material things early in life. He may not add them right away. It may be some little time, but He will give you all the material goods and necessities that you really need, and even a great many of the luxuries, if your life pleases Him. Yes, you can have those things when you know how to possess them and use them. What is an abundant life? What is abundance? Here is the definition: " possessing an over flowing fullness." It means great plenty — great plenty of life and real living. It means exuberance. It means abounding. That's the kind of life that Jesus Christ came to reveal that we could have. Not very many people under stand it. Not very many people understand what real Christianity is. Not very many professing Christians know what a real Christian life is. They're making themselves so unnecessarily un happy. The true Christian life, then, possesses an overflowing fullness of the things that are the fruits of the Spirit of God — an overflowing fullness of LOVE (it's God's love — it's a genuine, spiritual love), a fullness of JOY, and of PEACE, and of faith, of meekness, of temperance. Does YOUR life possess those things? Have those things come into your life to fill you? I know that you fall a great deal short of all of that. Every body does. We all still fall short. But that's our goal! That is the life that we shall live in the Kingdom of God. That is the life that we should strive for, and with God's help we can gradually grow more and more into it. That is the challenging life we grow into, the life of God's Spirit within us — that is the HAPPY life, that is the JOYOUS life, and the ABUNDANT life. The abundant life must be a life that has abundant RE SOURCES. If you have these re sources, they have to come from somewhere, because if you look within, you will find that they are not there! We have some re sources within, but they fall far, far short from the kind of abundant living that Christ reveals and I'm telling you about. You don't have these kinds of re sources within and you can't obtain them from the "around." Look around you. You can't obtain them from other people be cause they don't possess these resources either. We can have abundant resources if we know where to go to obtain those resources. But material wealth does not give anyone those resources. It can only add to them. You don't have them within. You can't get them from the around. But you can receive them only from the above, from God Almighty. God Almighty is the great Giver, not only of life, but of life more abundantly. God is the Giver of the great resources. He is the Almighty. God Almighty has a great deal of power to give you, to impart into you. You can receive from Him abundant FAITH, the resource of POWER, faith to drive out fear and worry, faith to drive out discouragement before obstacles, to know that it's going to work out every problem, power where you are now weak, to give you love to cover up and to drive out bitterness and resentment when others do you wrong. The LOVE of God will cover all of that and drive it out. God will give the resource of WISDOM that you now lack. God has all knowledge and all wisdom. God says if any man lacks wisdom, let him ask of God who gives to all men liberally. And if you really believe, it shall be given, and understanding, too! And then zeal and energy — real living, driving energy that is needed to do the work that you must accomplish. I am going to mention some thing personal. To conduct this Work I lead a very busy, driving life, and expend a great deal of energy. A physician friend of mine once asked me: "Mr. Arm strong, I don't see how you do it. Where do you get this energy? How do you keep going so long and under so many hours of strain and stress, and still have that driving energy? " I told him, "It's one of the resources that I get from above." Of course, I find it necessary to observe the laws of health and practice moderation in all things. It requires self-discipline. You, too, can have these re sources that make you happy. These are the things that we all need. These are the resources that can come only from God. And these are the resources that will produce those fruits of love, and joy, and of peace, and of patience. Most lives today are empty, absolutely empty! They are filled with boredom, with frustrations and fears. It is as you read in Isaiah 55:1: "Ho! Everyone who thirsts, come to the waters; and you · who have no money, come, buy and eat. Yes, come, buy wine and milk without money and without price." Everyone is really thirsty for the good things of life, for the happiness, the pleasant things and, to some extent, even exciting and thrilling things in life that we could and should have. But most lives seem empty. The well is dry, and they're thirsty. "Why do you spend money for what is not bread, and your wages for what does not satisfy?" (verse 2). What do you drink in? Jesus said that if you drink of Him, "He who believes in Me, as the Scripture has said, out. of his heart [innermost being] will flow rivers of living water" — not stagnant water, but living water, sparkling water. "But this He spoke concerning the Spirit, which those believing in Him would receive" — the Holy Spirit of God (John 7:38-39). The Holy Spirit of God is pictured as living water. It comes into you. You go to Christ to receive it. You don't bottle it up and put a cork on it. It flows out from you. The Holy Spirit flows out in love, peace and joy, radiating from you. There is no other way to find these resources. There is no other way to live a happy life. The laws of God are a way of life. The Bible in its whole is a way of life. Jesus Christ said that we must live by every word of God. If you live by every word of God, you will live according to the way of life that God has laid down in His Book, the Holy Bible. It is the way of life that is the abundant life. It's the way of the happy, the cheerful life that simply radiates. It radiates sunshine and happiness, and it's always happiness within. The well is not dry. It's filled! Now here is what this kind of life will mean. It means that you will be RADIANT. It means that God's Spirit in you will radiate cheerfulness and smiles, friendliness toward others, love, sincerity, calm courage, goodwill and interest in others, instead of being so self-conscious, with so much over interest in your own self. If the Spirit of God is in you, you will be plain and simple. You will put on no airs. There will be no posing, as most people do in the world. You will be natural, and not pretending. You will be honest and frank and unaffected, clean in mind and in body. You will be humble. There won't be self-confidence. There will be faith in God, instead. You will be humble, but you will have THE FAITH and THE POWER OF GOD, whose power is unlimited. You will be strong through this faith of God. There will be no weakness, but great strength. You will have wisdom, and you will have courage. You will have everything, every re source you need. You will be ready always to say, "I don't know," if so it be. You will be ready, always, to admit error when it is so proved, to confess wrong and to change to what is right, wherever you are wrong. You will be ready to accept correction and reproof, and to act upon it no matter how humiliating or painful. You will diligently study to learn the right way and to live it, and you will study the Bible to find it. You will face every obstacle that comes along — every difficulty, every problem and trouble — unafraid, in the full faith of God, looking to Him for wisdom and knowing that He will guide you and deliver you out of it. Here is the kind of attitude you will have. You will wish others to live their lives, too, up to their highest, their fullest, their best. You will be concerned for their welfare. You'll try to help others every way you can, never to hurt or to injure. You will never meddle. You will never dictate, interfere or give unwanted advice, or speak ill of, nor give gossip about others. Never will you go around griping, complaining and murmuring things that make you and others unhappy. You will always be willing to help others b y giving them a chance, and mainly you can help others by helping them to help themselves, by encouragement, by setting a good example, by thus inspiring and uplifting others, giving advice only when it's welcomed, and when they want it and are willing to open their minds to receive it. You will hew to the line of the one supreme goal of life, which should be to inherit the Kingdom of God, to be born of God into the very Family of God. You will relentlessly pursue this goal with zeal, with enthusiasm, with drive and with energy fired by godly ambition, with hope, with faith, living by every word of God. The Bible will be the authority that you obey, the authority that you look to for everything in your life. You will be overcoming your own human nature and the world, resisting Satan, drawing nearer to God by constant daily Bible study and by prayer, and by occasional fasting and prayer. That is the Christian life. It's the happy, the abundant life. It's yours for the asking. It's yours for the willingness to con fess your sins to God and to re pent of breaking His laws. It's yours if you're willing to DO what He says.